Komatsu or Komatsu Ltd. was established in 1921 in the city of Komatsu (which means “pine tree” in Japanese). At first, the company produced presses such as 450-ton sheet-forming press, which is the first Komatsu built press in 1924. Seven years later, in 1931, Komatsu produced first Japan´s crawler type farm tractor. During World War II, Komatsu also manufactured military machines, such as bulldozers, tanks or howitzers. In December 1968, Komatsu-made snow vehicles reached the South Pole. As the years have passed, Komatsu has grown into a world leader of construction equipment industry serving customers worldwide. The company is nowadays headquartered in Tokyo, Japan and has approximately 47000 consolidated employees. Komatsu is the world's second largest manufacturer of mining and construction equipment (after Caterpillar). In Asia, however, Komatsu holds even bigger shares than Cat (Japan, China). Komatsu declares to offer excellent construction, mining, forestry, military and utility equipment in terms of quality and technology. Covering a wide range of machines; from excavators to dozers; Komatsu states to offer efficiency, reliability and productivity. Komatsu´s important milestones include the developments of KOMTRAX in 1998 (Komatsu Machine Tracking System), AHS (Autonomous Haulage System) in 2008, launching the world's first driverless dump trucks, and the development of iMC (Intelligent Machine Control). KOMTRAX™ keeps track of what is the location of the machines and how much are they working, as well as it stores the data of the machine’s health status. The iMC is truly a revolutionary GPS technology, started with the release of D61EXi/PXi-23 “intelligent Machine Control” dozer at Bauma 2013 in Munich, Germany. iMC is currently available on specific excavators and dozers: PC210LCi-10, PC210LCi-11, D37EXi/PXi-23 and the rest of the iMC Bulldozer series (11 more models). The driving principle behind the development of the iMC is the customer’s productivity on the job site. Komatsu is the first company developing this project, making it an exclusive technology. Firstly, the machine equipped with GPS antenna and receiver tracks and receives a GNSS signal from multiple satellites via localization. Then, it gets converted into a “known” coordinate and compared against a 3D model of the project at the Base Station, which broadcasts the “corrected” information back to the machine using a radio signal. This allows the machine to proceed its settings of the blade/bucket (Semi-Auto tilt bucket) into the right position (compared to the 3D model of the project). Moreover, the cut/fill values are displayed to the operator, who can lift or lower the whole design by a fixed amount, or let the automatic hydraulic interface do the work and move the blade into exact design grade. The outcomes are for example improved fuel efficiency, lowered machine operating costs, improved operator’s performance and better material yield. Expressed in real numbers, Komatsu America Corp. states, that PC210LCi-11 offers up to a 63 percent improvement in excavating efficiency over a standard PC210LC-11. European customers claim that their productivity improved by 30%. Komatsu Europe announced the newest models at Intermat 2018 in Paris: the new range of backhoe loaders (including WB93R-5 and WB93R-8), excavator PC1250-11, WA380-8 and WA480-8 wheel loaders, HB215LC-3 hybrid excavator, PW148-11 and PW180-11 wheeled excavators, PC80MR-5 mini excavator and 5 more machines. Most models are equipped with engines complying with the EU-standard IV, which respects the latest emission regulations and all Komatsu machines offer a quiet and comfortable working environment as well as a rugged design for maximum crew safety. All machines meet the requirements for easy maintenance and thus reduce downtime. Excavators are the flagships of Komatsu. The production of hydraulic excavators started in 1968. After decades of improvements and upgrades, Komatsu excavators have ranked amongst the top-selling in its class. In 2008, Komatsu introduced first hybrid hydraulic excavator, the PC200-8E0. Hybrid model consumed on average 35% - 40% less fuel than the standard model PC200-8, thus saving great amount of emissions. The manufacturer offers varied range of crawler excavators, suitable for the toughest applications. Even though some models may be large and heavy, such as the PC8000-6 (up to 777 tons), all models are eco-friendly. Komatsu machines are suitable for wide spectrum of land excavation, from civil engineering through pipe jacking to mining. Crawler excavator engines provide advantageous fuel economy and CO2 reduction, being highly respectful of the environment. Some models, such as the PC1250-11 features brand new SAA6D170E-7 engine, which is EU Stage V ready. Current crawler excavators range from 8 tons (PC80MR-3) to 777 tons (PC8000-6). Machines can be further divided by weight into midi crawlers (PC88MR-8), standard sized (PC170LC-10) and large - mining crawlers (PC4000-11). There are also special types of excavators, such as the hybrid crawlers (HB215LC-3) or the intelligent machine control crawlers (PC210LCi-10). Wheel loaders are machines used on-site for transporting large amounts of material (such as soil, sand, snow, asphalt, rock, gravel) from one spot to another. First Komatsu loader (called “pay loader” at that time) was JH30B — 4 wheel drive machine — constructed in 1965. It offered 1 m³ of bucket capacity and with combination of efficient digging ability together with cheap price, this model became popular as the sales increased rapidly in Japan, placing Komatsu on the wheel loader market. In the following years, Komatsu launched more models with different payloads and capacities such as JH60, JH65C, JH90E, JH80B or W90 (1976). The last-mentioned machine shut-down the manufacturing of JH and 500 series of wheel loaders and began the production of W series, designed for export. The W90, concretely, was designed for tropical and deserted areas. In 1981, Komatsu introduced its most famous and most successful series ever — WA series. It all began with the flagship of WA series, WA30-1 (0,34 m³ bucket capacity). Komatsu followed by the release of WA40-1 in 1984 — all purpose machine for engineering, construction, gas, landscaping, etc. Then, Komatsu started to manufacture larger and larger wheel loaders as there we bigger demands for them: WA200-1 (1984), WA350-1 (1984), WA800-1 (1985). In 1993, the WA-3 series was launched with the introduction of WA100-3. In 1998, Komatsu launched two models, WA600-3 (6 m³ bucket, 327 kW engine) and WA800-3 (11 m³ bucket, 603 kW), the upgraded versions of WA600 and WA800, for the first time in 12 years. Starting with the release of the WA470-5 Galeo in 2001, all wheel loaders got the KOMTRAX system as a standard feature. This model also reached Stage II regulation of emissions of Japan/US/EU and greatly reducing the noise level against previous models, having 4 m³ bucket capacity. The WA320-6 (2008) offered hydro-static transmission for the first time, snow mode for snow removal, ROPS/FOPS cab with improved visibility and 3 m³ of bucket capacity. In 2010, Komatsu launched the upgraded version of the world’s largest mechanical wheel loader, WA1200-6. Its specs are: 20 m³ bucket capacity, 210 tons weight, 18,3 m long x 5,8 m wide x 7 m high, 19,3 km/h travel speed, Komatsu SSDA16V160E2 engine rated at 1411 kW. In 2012, Komatsu launched WHA-7 series, meeting Stage III emission regulations, e. g. WA500-7 (5,6 m³ bucket), WA380-7 (3,2 m³) or WA470-7 (4,2 m³). In 2016 and 2017, Komatsu launched its newest series, WA-8. Although the Komatsu mini excavators are smaller than their larger crawler counterparts, they are equipped with several features and benefits: compact and light size for the application everywhere (particularly narrow and tight spaces), operator’s-friendly environment (comfortable and ergonomic cabine, controllability), easy maintenance, KOMTRAX™ tracking system. Minis range from 1 to 5,3 tons (PC09-1 - PC55MR-5). They are used for a variety of works including pipe laying, architectural foundation, demolition, soil digging, excavating, forestry, road construction and snow removing. The very first Komatsu mini excavator is the PC02, constructed in 1976. It is also the first PC series model launched after the end of Komatsu-Bucyrus partnership. The biggest difference against regular-sized hydraulic excavators, is the adaptation of boom slide system and boom swing system with side ditch digging. PC02 weight was 2500 kg and the bucket capacity was between 0,05 and 0,13 m³. After the introduction of complete PC series in 1980, this model’s name was changed to PC20. Komatsu launched in the following years other minimal rear-swing models such as PC50UU-1 (1987), PC01 (1990), PC45 Avance R (1990), PC50UU-2 (1992), PC78US GALEO (2001) and some series — MR-2 Series (2003), MR-3 Series (2007), MR-5 Series (2017). Skid steer loaders are mostly useful for loading in small areas. They differ from regular-sized wheel loaders as the direction of its tires is fixed. Some skid steer loaders have a crawler instead of tires such as Komatsu CK20-1, CK30-1 and CK35-1. Skids are used mainly for loading and unloading material thank to their compact body. Nevertheless, they can be also used for different applications such as livestock farming, gardening and civil engineering. Moreover, the bucket can be replaced with a fork, transforming skid loader into a material-handler. Komatsu SK04 (1997-1999) belongs to smallest skid loaders due to its weight of 1520 kg and 0.16 m³ bucket capacity. The SK04 is powered by Perkins 103-10 diesel engine rated at 15,1 kW (20,3 HP). Due to its small and compact size, this mode is ideal for restricted area work, where the space is limited. The SK07 is a larger model than SK04, offering 0.36 m³ bucket capacity and Yanmar 4TN84 diesel engine rated at 29 kW (38,9 HP). Its weight is 2360 kg and can travel 10 km/h. The SK510-5 (launched in 2010) features new innovations such as PPC hydraulic servo-controls, tilting cab for full and easy maintenance or all around visibility. Its bucket capacity is 0,23 m³, operating weight 1860 kg, breakout force 1245 daN and engine power 23,9 kW (32,1 HP). The SK714-5 is a versatile model, offering 0,35 m³ bucket capacity, breakout force of 1716 daN and engine power 34,9 kW (46,8 HP). Komatsu SK714-5 is therefore larger than SK510-5, weighing 2530 kg. Brand new Komatsu SK815-5 (2018) features a two-speed transmission. The first speed is used for digging or climbing, whereas the second speed (16 km/h) is used for faster transport around the jobsite. The SK815-5 offers 0,4 m³ bucket capacity, breakout force of 1716 daN and engine power 36,2 kW (48,5 HP). The latest and also largest model (2018) is the Komatsu SK820-5. This model can operate with many attachments, extending its versatility. Control of all functions is ensured by joysticks and a proportional pedal. Komatsu SK820-5 is 3 tons heavy model, having 0,4 m³ bucket capacity and 1867 daN breakout force. The drive is ensured by Komatsu S4D84E-6BMFD engine rated at 36,2 kW (48,5 HP). The beginning of forklift manufacture in Japan dates back to 1953 (1987 in the US). Komatsu built on years of experience in production of construction machines and manufactured versatile forklifts. As usual, Komatsu products are shaped into detail; even the diesel engines are branded. Therefore, maximum functionality is guaranteed. Komatsu states, that internal combustion forklifts can be used even in some extraordinary situations, using specific attachments. In this way, diesel forklift transforms into a useful helper, who can handle non-standard materials like lumber, pulp or recycling paper. Diesel forklifts are available in those series: FH, CX50, DX50 and EX50. The two largest models are FD200-7 and FD250-7 (being the top one), offering high productivity Komatsu SAA6D107E-1 engines (173, respectively 221 HP, 6-cylinder, 6.7 liter displacement), rated capacity of 20 000/25 000 kilograms, comfortable cab design with KOPS system and KOMTRAX™. Although crawler excavators seem to be more popular than excavators that have wheels for an undercarriage, wheel excavators provide better mobility as the wheels allow higher travel speeds. Wheel excavators use outriggers and a front blade during work for better machine stability. The PW range represents rugged, EU-orientated wheel excavators featuring HydrauMind system providing improved performance for any task. The PW148-10 and PW148-11 are medium-sized wheel excavators weighing more than 14 tons. Both machines have 0,86 m³ bucket capacity, tail swing radius of 1,85 m and 5,75 m digging depth. Although they share same drive power (90 kW/121 HP), they differ in the type. Whereas Komatsu PW148-10 is equipped with Komatsu SAA4D107E-2 — EU Stage IIIB diesel engine, the PW148-11 is equipped with more modern Komatsu SAA4D107E-3 — EU Stage IV engine with lowered fuel consumption by up to 13 % in comparison with PW148-10. 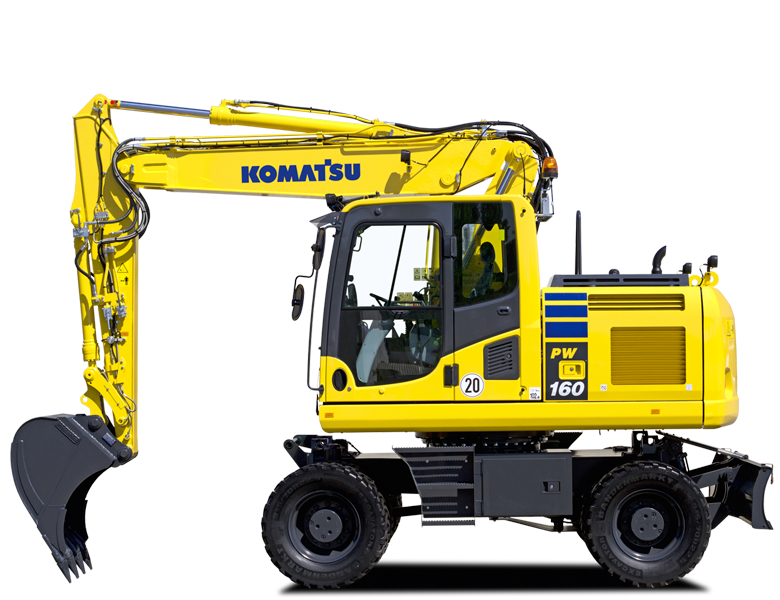 As for the previous models, the basic model Komatsu PW160 was transformed into few generations and series such as PW160-8, PW160-10 or PW160-11. All of these 3 models have 1,13 m³ of bucket capacity and digging depth of 5,86 m. Their weights differ by various configurations and the usage of attachments, however, it ranges between 15 tons and 19 tons. What they really differ in is the engine. Whereas PW160-8 is equipped with Komatsu SAA4D107E-1 Stage IIIA engine of 97 kW (130 HP), Komatsu PW160-10 owns Komatsu SAA4D107E-2 Stage IIIB engine of 110 kW (148 HP) with 8 % reduced fuel consumption against PW160-8. Moreover, Komatsu SAA4D107E-3 is equipped with most modern Stage IV engine, Komatsu SAA4D107E-3, reducing fuel consumption by another 4 % against PW160-10. Komatsu PW180-10 and PW180-11 are large excavators, suitable for digging on bigger worksites. Their bucket capacity is 1,13 m³ and they are capable of digging 6,04 m deep, having 123 kW (165 HP) engine. The largest Komatsu wheel excavator is PW220-7, weighing 23,36 tons. This machine offers 1,2 m³ of bucket capacity, digging depth of 5,4 m, tear-out force of 145 kN and almost 10 m of horizontal reach. In 2004, Marubeni Komatsu revealed its first series of low profile telehandlers — WH range. These are characteristic of the “super-low boom profile”, providing secured boom extensions. Lifting heights range from 9 m to 16 m and the Stage II engines from 81 HP (60,4 kW) to 99 HP (73,8 kW). Telehandlers are aimed both for construction and material handling operations, featuring Komatsu's CLSS (closed load sensing system). Operator’s comfort is also secured by spacious cabine, suspension seats and tiltable steering columns. All machines are equipped with rubber wheels, Komatsu 74 kW engines and can travel up to 38 km/h. The WH613 is the lightest machine (9,8 tons), capable of lifting 3,5 tons of material with maximal lifting height of 12,7 m (1,23 tons) and 8,8 m horizontal reach. The WH713 weighs 10,55 tons and can lift 3,7 tons of nominal load. Maximum lifting height is 13,1 m (8,7 m horizontal reach). The WH714 is larger model than WH713 and WH613 offering 4 tons of payload (10,62 tons weigh), 14,1 m max. lifting height and 9,6 m horizontal reach. Komatsu WH716 is the heaviest model (11,59 tons) offering the top lifting height (16,1 m), whereas WH714H has the largest nominal load (4,5 tons). Both WH714H and WH716 have 500 mm centre of gravity providing substantial stability. Backhoe loaders, like WB97S-5, are multifunctional machines, because they can serve both as a wheel loader and as an excavator. It is possible thanks to its work equipment at the rear and at the front of the machine, eg. the WB93S-5 is optimal for digging as well as for loading due to its high breakout force (6.500 kg), lifting capacity (3.900 kg at maximum height) and bucket capacity up to 1.1m³. Komatsu Backhoe loaders are capable of many tasks, such as: digging, small demolitions, excavation, landscaping, materials transportation, asphalt breaking or paving roads. Such versatility lies within the WB93R-5: being 5.8 m long and 4.3 m high with a maximum reach of 5.75 m, this model suits all previously mentioned tasks. The stability during the work is provided by outrigger extends. Komatsu offers rigid 2 and 4 wheel steering models (4-wheel-steer models WB93S-5 and WB97S-5 show a better maneuverability). Komatsu backhoe loader models come with various innovations, such as a comfortable operator´s environment (spacious cab, wide round glass surface for clear visibility, ergonomic interior, reduced noise, air-condition). Whatsoever, WB93S-5 and WB97S-5 offer 2 working modes, “Power” and “Economic”, which means that the operator can arbitrarily switch them and choose between maximum power and minimum fuel consumption. In September 2018, Komatsu launched a new generation of backhoe loaders, featuring fuel efficient engines in line with EU Stage IV emission regulations (NOx emissions are reduced by 80% vs. EU Stage IIIB engines). These are WB93R-5 and WB93R-8, showcased at Intermat 2018 in Paris. The beginning of electric forklift manufacture in Japan dates back to 1990s. Fuel consuming engines were creating simply too much emissions and the Earth started to be unable to handle it. That is the reason engineers created AC drive. Komatsu implemented new engines into their forklifts and build a brand new series - electric forklift trucks. These are environmentally-friendly as they do not emit exhaust gas, save more energy and also create less noise than their diesel counterparts. This makes perfect working conditions around warehouses and food processing places, because there is always a priority for environmentally friendly machinery. Depending on the load to be handled, Komatsu offers a range between 1 and 3 tons models. Previous series (not manufactured anymore) were AM-2R/AE-2R series, BE-3R serie and AMX~BMX series. Nowadays, efficient electric modes are swiftly replacing combustion models, both for indoor and outdoor use. Current Komatsu electric forklift truck offer contains AE50/AM50 series and BBX50 serie (ca. 20 models total). LPG trucks are widely used machines both indoor and outdoor. Their biggest advantage is their versatility as they are suitable for wide range of material handling works. LPG forklifts use gas bottles filled with propane. Driving and handling abilities are similar to these of diesel forklifts. On the one hand, the cost of operating with gas forklifts is more favourable than the cost of working with diesel forklifts (similarity to cars). On the other hand, there could be a disadvantage — the availability of propane/gas bottles. Komatsu launched its first LPG machines around 1987. One the those models was the FG18HT-14, offering 1,75 tons of nominal load, 500 mm centre of gravity, hydraulic transmission and Toyota 34,1 kW engine. A year later, Komats dropped the FG50-7, weighing 7,34 tons and 5 tons of nominal load, 600 mm centre of gravity, 3 m lifting height and Nissan TB42 engine of 66 kW. One of the biggest machines used to be the FG70T-7, 9-ton heavy model capable of lifting 7 tons of material, driven by Nissan TB42 engine of 66 kW. Komatsu forklifts are nowadays primarily manufactured in Komatsu America Corp. — a U.S. subsidiary of Komatsu Ltd. There are 3 main LPG forklift series at this moment: AX50, BX50 and CX50. The history of Komatsu Bulldozers, or simply Dozers, dates back to 1943. During World War II, Komatsu produced machinery for the Japanese army. One of those machine types, were so called Model 1 Ground Leveling Machines, which were the prototypes of Japanese bulldozers. In 1947, Komatsu introduced the D50 bulldozer, which happened to be the first mass-produced Komatsu dozer. In 1975, Komatsu do Brasil Ltda. manufactured the modified version of D50, dozer D50A, indicating Komatsu´s first foreign production of construction machinery. Komatsu also built the world's largest and most productive bulldozer, the D575A (1989-2012). This colossus used to dominate other dozers in every aspects: 11.1 m long, 7.39 m wide, 4.88 m high and 152 tons heavy beast with 1150 HP (830 kW) engine. The D575A was manufactured in few modifications, the D575A-3 SD Super Dozer being the largest one. Since 2008, Komatsu has also helped to clear antipersonnel landmines in Cambodia, Afghanistan and Laos, using special-made demining machines, D85MS-15, based on bulldozer chassis. Those white helpers (they are painted white) weigh some 27 tons and are remote-controlled. 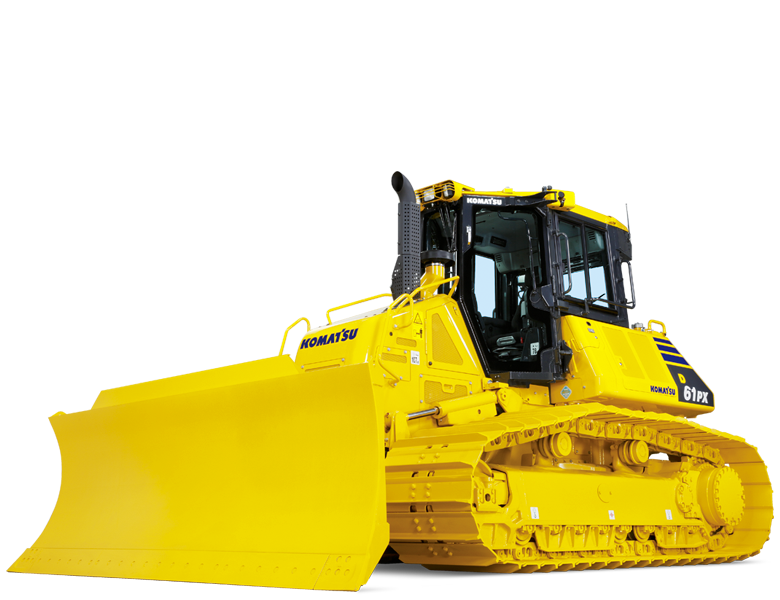 Based on the weight (ranges from 8 to 108 tons), actual Komatsu dozers can be divided into categories: small (eg. D37EX-24), mid-size (D61PX-24), large (D155AX-8) and mining (D475A-5) - 27 dozers in total. The Dozers profit from unique undercarriage design, making them very cost-efficient in their class. Komatsu is also proud of its innovative and revolutionary design: the coolers and cooling fan are moved to the rear, so the operator sits more forward achieving clear view to the top of the blade and the dozer is much better balanced. Models, which name ends with “i” (such as D37EXi-24) feature intelligent machine control. The largest Komatsu dozer is the D475A-5. This giant is equipped with Komatsu SAA12V140E-3, 12-cylinder engine of 900 HP (671 kW), weighs 108 tons and wields a blade 6.21 m wide. A hydraulic breaker, like the JTHB120-3, is the right companion for a variety of tasks when constructing, demolishing, recycling, mining or quarrying. Komatsu breakers, such as JTHB450-3, apply high-caliber impact energy to crush material like concrete or rocks. The impact power is delivered through a combination of hydraulic and nitrogen gas energy (30 % hydraulic and 70 % nitrogen energy) thus no need for an accumulator. Breakers range from 90 to 4550 kg (suitable for machines from 0,7 to 70 tons). The complete range of Komatsu JTHB hydraulic breakers is made of 15 models: JTHB08-3, JTHB10-3, JTHB20-3, JTHB30-3, JTHB40-3, JTHB50-3, JTHB50WB-3, JTHB60-3, JTHB120-3, JTHB160-3, JTHB210-3, JTHB290-1, JTHB350-3, JTHB450-3 and JTHB650-3. They all fit the corresponding excavators, eg. JTHB30-3 fits PC30MR-3, JTHB160-3 fits PC160LC-8, JTHB450-3 fits PC490-10 and so on. All breakers are equipped with box brackets with noise-reduction design, making them environmentally-friendly in urban areas. There are also many optional kits available for all products, for example the underwater kit, tunnel works kit, extreme temperature kit or dusty environment kit. Even the smallest model, the JTHB08-3 (40 mm tool diameter, 90 kg, 60-130 bars operating pressure), is capable of dealing massive blows to concrete or rock surface. On the other side stands the JTHB650-3 breaker (178 mm tool, 4550 kg, 140-180 bars operating pressure), offering the biggest penetration rate. All-wheel drive, low centre of gravity, Komatsu traction system, strong engine, articulated steering - thanks to those features, “Komatsu articulated dump trucks are highly adaptable to rough terrain”. 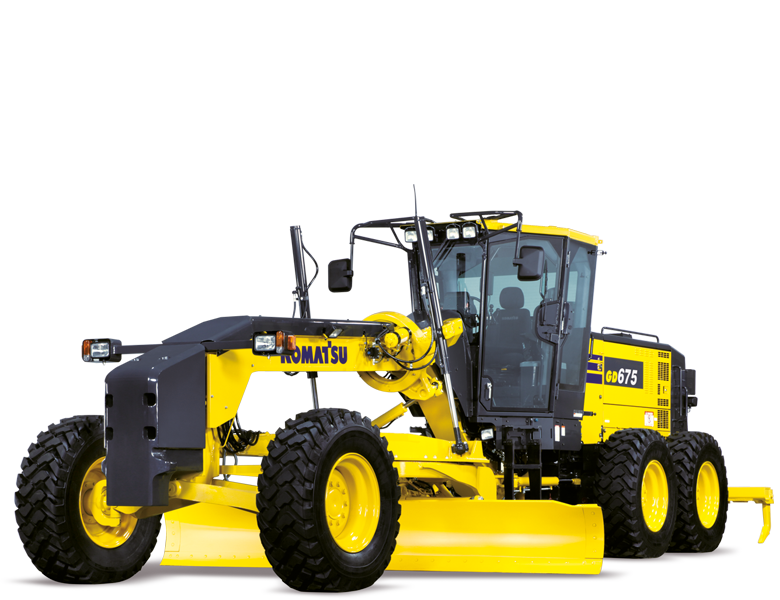 Komatsu launched its first model, the HM400-1, on the Japanese and USA market in 2001, after there were strong urges and many requests on the market for its development. This particular model was assembled using components and technologies for wheel loaders and dump trucks. A year later, Komatsu continued with the releasement of articulated dump trucks HM350-1 and HM300-1, all being a market successes. 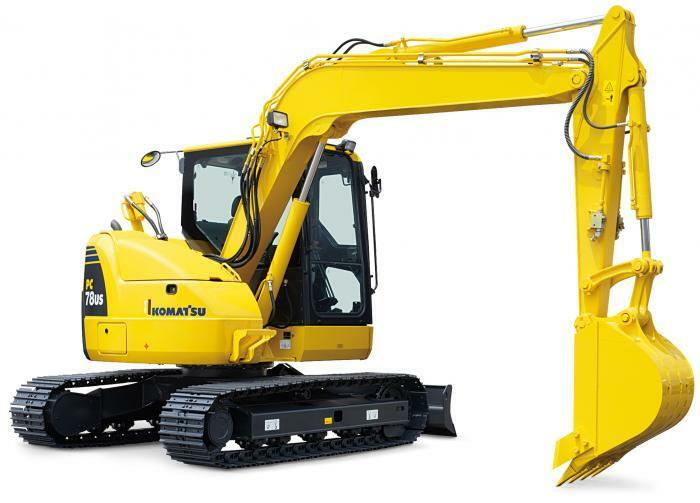 Komatsu currently offers two models in this category: HM400-5 and HM300-5. The HM300-5 is a smaller model compared to HM400-5, with a maximum payload of 28 tons (HM400-5 payload equals 40 tons) and body capacity of 17.1 m³ ( HM400-5 has 24 m³). Both machines are equipped with powerful and eco-friendly EU Stage IV Komatsu engines (248/353 kW). As commonly utilized by today, both models are supported by KOMTRAX™ (Komatsu Wireless Monitoring System). This system uses updated wireless monitoring technology, in order to deliver valuable information about the machines to the local Komatsu distributor and the machine owners. KOMTRAX™ keeps track of where the machines are (what is their location) and what is their performance (how much they are working). It can also work as a coaching tool by monitoring indicators such as idle time, time in economy/power mode or hydraulic relief time, thus encouraging the operators to maximize production. Eliminating the unproductive machine hours leads to less fuel expenses and operating costs. Moreover, KOMTRAX™ provides information about important attributes such as energy savings, attachment usage, travel records, caution records or statistics about machine temperatures and pressures. Because the monitoring is 24/7 online, it can really help the technicians with eventual maintenance and troubleshooting. Rear tipping dump trucks are also called haul trucks or rigid dump trucks. Their payload often ranges in hundreds of tons. These giant-sized trucks are therefore used in large mines and quarries, transporting loads of material around the worksite. The machines are equipped with rigid frame (hence rigid dump trucks) and conventional steering with the drive mostly at the rear wheel. The Komatsu’s first ever constructed dump truck is the HD150 (1954) with 15 tons of load capacity. 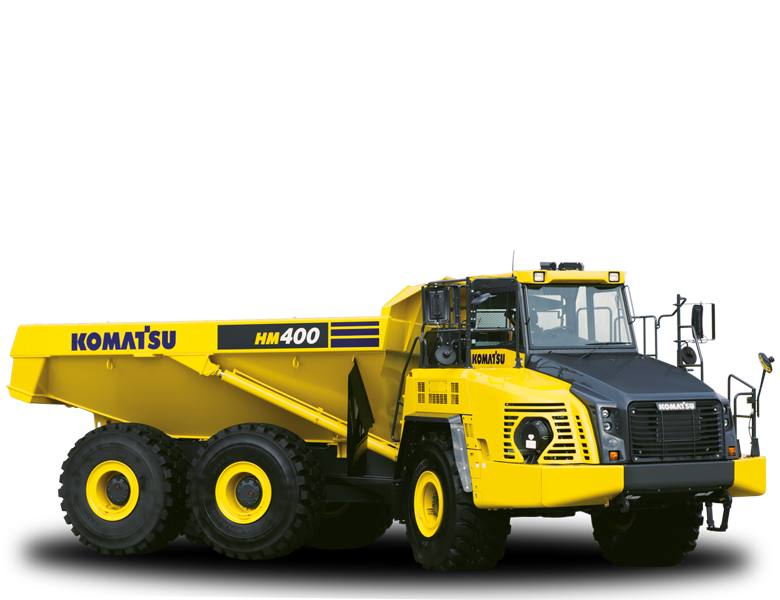 Komatsu started to manufacture dump trucks as a competition to US Euclid trucks. During the following years, Komatsu released other models such as HD180, HD320, HD325 and HD1600M, which differed in the payload, progressively increasing as there were bigger and bigger demands. Bigger trucks also meant more powerful drive and engines, which lead to construction of electrically driven trucks (and transmissions) instead of mechanically. One of the newer electrically driven models is the 860E-1K (2008). Its load capacity exceeds 240 tons, making it a super-sized dump truck capable of working in large quarries providing maximum performance. The two newest series are the HD-8 series (including few models of HD-7) and the E-series (electrically driven) of Komatsu rear tipping dump trucks. Komatsu mobile crushers/recyclers are crawler-type machines equipped with jaw crusher with large crushing power and capacity. They are used on-site to break, crush and recycle various material such as concrete debris, asphalt, stones, rocks, damaged soil or even felled trees. Two vertical jaws of the crusher (fixed jaw and swing one moving back and forth) create compressive force to crush required material. Crushed debris can be later used as a recycled material for roadbeds construction. Komatsu crushers are designed for easy clearance — the crusher can be quickly opened in order to clear the uncrushed debris. Komatsu’s first self-propelled crusher was the BR60 Galapagos, constructed in 1992. Mobile crushers were built, because there was a high demand for machines capable of crushing (recycling) the debris on site, in order to save the costs of transporting. In 1993, Komatsu launched its second model, BR200 with higher throughput than BR60. Two years later, in 1995, crusher BR500JG was launched. 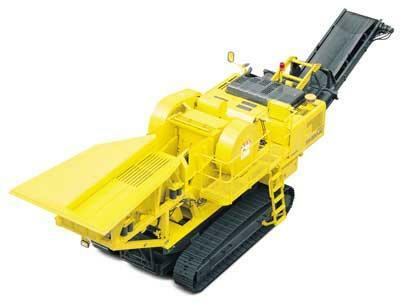 With crusher size of 42"x30", this model was capable of screening and crushing large amounts of debris. Next model was the BR350JG, launched in 1996. It had also improved silo capacity (3 m³) and hydraulic drive power of 118 kW, which was capable of relocating the 30 tons heavy model wherever needed. In 2001, Komatsu put on market BR550JG Galapagos, equipped with large 44 inch (112 cm) jaw crusher, achieving the largest throughput in its class. The BR550JG offered 6 m³ of capacity and however it weighed 47,5 tons, the compact and light body design made it easily operable on demolition and engineering sites (228 kW drive power). One of the latest Komatsu crushers/recyclers is the BR580JG-1 (2007). It offered 460 ton/h production, a 1050 mm long conveyor belt, Tier 3 (Stage 3A) SAA6D125E-5 engine of 275 kW. Depending on attachments, BR580JG-1 could weigh up to 51 tons. In 2009, Komatsu launched BR380JG-1E0, 33 tons heavy crusher with 4 m³ silo, 149 kW engine (Stage IIIA) with max. production of 240 tons/hour. Motor graders are designed for creating a flat surface during the grading process, leveling aggregate and snow removal. Komatsu motor graders history is quite short, dating back to 1952. 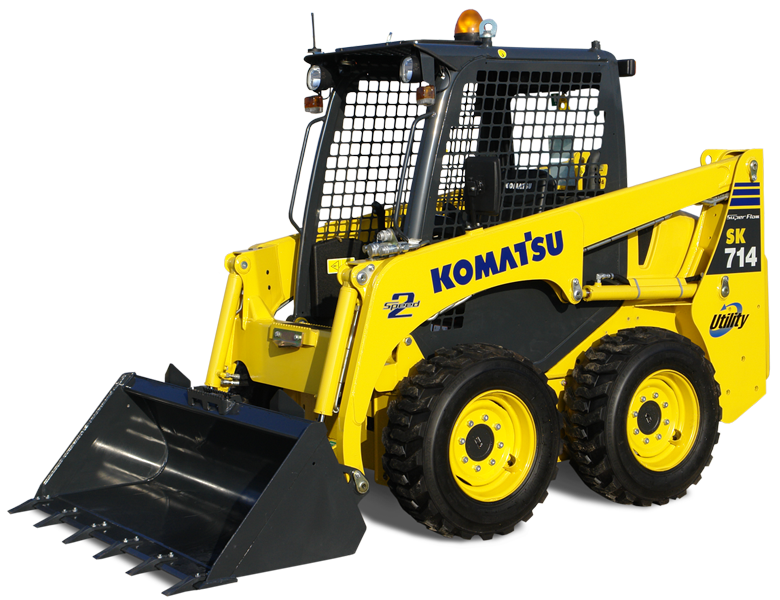 The first Komatsu model was the GD25-1, a small model made for working on narrow roads or in small cities and villages. Komatsu immediately followed with the release of GD30-1, an upgraded version of GD25-1, offering two tandem rear axles for better leveling, excavating ability and smoother turning. Later on, Komatsu begin with construction of larger motor graders, such as GD37-1 (1953). The name of the model corresponded with the length of the grader´s blade, meaning the blade of GD37-1 was 3.7 m long. Graders also began to be frequently used for snow removal, being equipped with first sealed driver's cabs or heaters. In 1955, Komatsu exported those motor graders to Argentina, achieving the first export of construction equipment. Another two models from the old GD Series were the GD37-4 (1958, being the first Komatsu hydraulic motor grader) and GD37-6H (1970). During the following years, Komatsu released upgraded models with improved engines and components: GD605A (1978, “A” meaning “articulated”), GD600R (1978, “R” meaning “rigid”), GD405A-1 (1981), GD200A-1 (1982), GD405A-2A (1989), GD825A-2 (1993), GD405A (1998). The “modern era” of Komatsu motor graders has started in 2002, launching the GD655. This model was equipped with the world’s first dual mode transmission with the torque converter. The GD655 also adapted and improved CLSS hydraulic system, new engine meeting the emission regulations from that time (Stage II) and KOMTRAX™ system. Komatsu later released innovative models based on the GD655, such as the GD655-3 motor grader (Komatsu SAA6D114E-3 engine of maximum 149 kW - 200 HP, Tier 3 certified, 4.27 m wide blade, operating weight of 17 tons) and the GD655-5 (SAA6D107E-1 engine of 163 kW - 218 HP = 9% power increase, 16 tons of weight = 9% of weight increase and 30 % of fuel consumption savings compared to the GD655-3). Two newest Komatsu models are the GD655-6 and the GD675-6. Komatsu GD655-6 focuses on the US market offering even better performance than all previous models in class, featuring environmentally-friendly Tier 4 certified SAA6D107E-3 engine of 218 net HP (163 kW). As a matter of course, Komatsu equipped the GD655-6 with dual-mode transmission, allowing the operator to switch between “power” and “economy” modes, burning 5 % less fuel (10 % in economy mode respectively) compared to the GD655-5 and 416 l fuel tank capacity. The GD655-6 also possesses the longest wheelbase in class with 650.2 cm. Despide the length of the wheelbase, the turning radius is just 740 cm. The mouldboard is almost 427 cm long. European market focused, Komatsu GD675-6 is an improved version of GD675-5 showing better performance. New Komatsu Stage IV relevant SAA6D107E-3 engine offers 221 HP (165 kW), reducing NOx emissions by 80 % (compared to EU Stage IIIB engines), saving up to 15 % of fuel compared to GD675-5. The mouldboard is 427 cm long and the whole model weights between 17.2 and 19.7 tons, depending on its configuration. It also shares the longest wheelbase and the turning radius with GD655-6 (650.2 cm wheelbase, 740 cm radius). As other Stage IV relevant machines, GD675-6 works with the updated version of KOMTRAX™, providing all the important info about the condition of the machine. Forwarders are forestry vehicles used to carry felled logs from the stump to a roadside landing. Forwarders carry the logs clear of the ground, reducing soil impacts. Forwarders often work with harvesters in cut-to-length logging operations. Komatsu Forest was founded in 1961 Umeå, as Umeå Mekaniska (Sweden), and established to Komatsu Forest AB in 2004. The head office is still located in Umeå and the company has about 1700 employees. The production nowadays consists of a production unit for wheeled machines and heads in Umeå, Sweden and a production unit for tracked machines in Chattanooga, USA. Net sales in 2017 reached 509 Million Euros. Komatsu Forest AB is fully owned by Komatsu Ltd of Japan. The early Komatsu forwarders such as 830.3, 840.4 and 860.4 were constructed around years 2007 and 2008. These offered net load of 9 tons, 12 tons and 14 tons, respectively, and 110 kN, 155 kN and 174 kN boom lifting torque. All of them are 8-wheel vehicles. Newest Komatsu Forest machines are the 2017 models featuring Stage IV ready engines: 835, 845, 855, 875 and 895. Komatsu 835 is a forwarders ideal for thinning due to its compact size and maneuverability. It is equipped with 127 kW (170 HP) eco-friendly Stage IV engine rated at 750 Nm torque. It also operates with 159 kN tractive force and provides 11 tons gross load. Rated payload capacities for the 845, 855, 875 and 895 are 12, 14, 16 and 20 tons, respectively. Moreover, the new Stage IV (Tier 4 final) engines provide 9-15% more horsepower and lower fuel consumption, compared to the prior models. Rough terrain capability is improved with hydrostatic transmission pumps/motors. The 855 is a allrounder, suitable both for cutting and thinning (187 kN tractive force). The 16-tons load capacity Komatsu 875 belongs to a class of its own with tractive force of 214 kN, offering productive cutting and thinning performance. Komatsu 895 forwarder is the largest and most productive machine, offering 20 tons of capacity, 262 kN tractive force and 210 kW (282 HP) engine. Standardly an 8-wheel machine can be transformed into 6-wheel vehicle with just two wheel in front and four at the rear. The cabine is spacious, low-noise designed and ergonomic, providing maximum comfort for the operator. Harvester are basically tire-type hydraulic excavators equipped with the harvester head. They are used for felling trees, processing - limbing and bucking. The harvester’s head is also equipped with additional mechanisms for tinder grabbing, log measuring and other tasks. Older Komatsu harvesters such as the 931.1 or the 941.1 (2010/2011) are 6-wheel machines with 4 smaller wheels in the front and 2 larger at the rear for better stability. The 931.1 is over 19 tons heavy machine with diesel engine rated at 193 kW (259 HP). Its max. horizontal reach is 10 metres and the boom lifting torque is 175 kN. The 941.1 is larger and stronger machine than 931.1 (23,5 tons), offering 210 kW diesel engine, 190 kN boom lifting torque and 10 m horizontal reach. The Komatsu 901 is the first harvester with Tier 4 Final/Stage 4 engine (150 kW), making it highly eco-friendly by keeping low emission rate, reducing engine noise level and improving fuel economy. The 901 also features brand new cab with improved visibility and working environment (remote control, cab heater). Another improvement is 3-pump hydraulics, providing 584 l/min hydraulic capacity and new hydrostatic, power-optimised transmission with 156 kN traction force. Whereas the 901 is more thinning-orientated harvester, the 911 is an all-rounder. The machine highlight is Komatsu Comfort Bogie — portal bogie providing stability ground clearance and maneuverability. The specs of 911 are: 17,6 tons weight, 170 kW power engine, 163 kN tractive force, 10 m standart reach (11 m optional boom). Komatsu 931 is more of a logging harvester, due to its larger force. It weighs 19,6 tons and offers Stage 4/Tier 4 Final 185 kW diesel engine with 736 l/min hydraulic capacity and 168 kN traction force. The 951 is Komatsu’s largest and most powerful harvester, suitable for clear cutting. This machine is more than 8,3 m long and almost 4 m high, weighing around 22,6 tons. The 951 offers 210 kW (282 HP) diesel engine (Tier 4/Stage 4 - eco-friendly) and 232 tractive force, capable of dealing with the toughest forestry applications. These electronically driven reach trucks are capable of lifting different materials in narrow aisles of warehouses. Reach trucks have two outer legs, which distribute and divide the load weight. The drive wheel is located under the operator’s seating place, moreover, the operator sits sideways when operating the machine. Reach trucks range from 1,2 to 2,5 tons of nominal load capacity. Komatsu FB12RJ-2R is the smallest machine capable of lifting 1,2 tons of material. Its hoisting motor of 11,5 kW reaches hoisting speed of 12 m/s. The traction motor of 5,2 kW allows travel speed of 1,63 km/h. The largest machine, FB 25 RW-1R has 600 mm centre of gravity, can lift over 2,5 tons of material and weighs around 3,88 tons (the weight of its battery is 1,1 tons!). The rest of reach trucks is also electrically driven, e.g. FB14RW-3E, Komatsu FB20RW-1R, FB16RJ-2R and 6 more machines. Concrete pulverizers are similar to crushers. Identically, they are just a basic model without hoselines and adapters for excavators. Pulverizers differ in size and power, too. The smallest one, Komatsu 200, originally constructed as an optional attachment for PC200 excavator, weighs 1,65 tons and offers a breakout force of 460 kN. Vice versa, Komatsu JDP 70 CP is a 5,4 tons heavy pulverizer, roughly tripling the breakout force of Komatsu 200. Pulverizers are - like crushers, used to crush and recycle concrete or similar substances. On the other hand, its ability to cut materials is limited compared to crusher shears. Compactors are machines which use the mechanism of compaction to reduce the size of material waste. They are standardly powered by hydraulics and can reach various sizes and shapes. Komatsu compactors are mostly used in landfill sites as they are equipped with spiked and sealed wheels to drive over the waste. They are practically tractors with large bulldozer or loader attachments in front of the machine. Komatsu offers 4 machines in total, two of them being the dozer type (WF450T-3, WF550T-3) and two of them being the loader type (WF450-3, WF550-3). All of them are equipped with protected axles, bodyguard and sealed wheels for highest durability, front sheepfoot crusher with scrapers, comfortable ROPS cab and they provide comfortable maintenance access and cleaning of cooler grill, located in the very front part of the machine. Komatsu WF450T-3/WF450-3 models are equipped with Komatsu SA6D125E-2 engine rated at 194 kW/263 PS, whereas WF550T-3/WF550-3 models use Komatsu S6D140E engine rated at 235 kW/320 PS. The WF450T-3 is a dozer-type machine, weighs 25,4 tons and has 4265 x 1900 mm dozer blade in front. The second dozer-type machine is WF550T-3, heavier than WF450T-3 (35,1 tons) and also possessing a larger blade (4550 x 2005 mm). The remaining two machines (WH450-3 and WH550-3) are loader types, weighing 26 tons and 35,5 tons, having 3,9 m³ / 4,7 m³ buckets. Komatsu concrete crushers are just attachments, it is a basic model without hoselines and adapter for excavator. These demolition shears support the demolition machine offering. A full range is made of various shear sizes. The smallest ones, JCYS 12, weigh only 1.51 tons, require a carrying device of 12-22 tons and provide a breakout force of 1030 kN. On the contrary, the largest shears - Jumbo 2300, weigh 11 tons, require a carrying device of 90-100 tons and are capable of a breakout force of 2800 kN! Every shears fits the brand excavators as long as they match the required carrying device capacity. They can crush anything from concrete to rock and cut through materials like wire or rebar. Scrap cutter are attachments that can be easily equipped on Komatsu construction machines such as excavators. Using them, Komatsu machines gain a wider range of application as they can easily and effectively cut through various material. There are actually 3 cutters available: JHSS200 (1490 kN cutting force, 2,32 tons weight, equippable on 20-28 ton carrying device), JHSS200R (1490 kN cutting force, 2,38 tons weight, equippable on 20-28 ton carrying device) and JHSS400R (2255 kN cutting force, 3,9 tons weight, equippable on 30-45 ton carrying device). As the name suggests, pallet stackers are machines used for pallet handling and stacking, mainly in warehouses. There currently just 3 models offered: FB13RL, FB15RL and FB18RL ( 2012 all). The first model, FB13RL is the smallest machine, over 2 tons heavy, capable of holding and lifting load of 1,25 tons with 3 metres of lifting height. Medium-sized FB15RL weighs 2,22 tons and can lift up to 1,5 tons of material. The lifting height is the same as for FB13RL — 3 metres. The largest machine, FB18RL, shares the same lifting height of 3 metres, but offers higher lifting capacity — 1,8 tons. It weighs over 2,3 tons and the turning radius is 1,7 m. All 3 models are electrically driven. Komatsu started the production of diesel engines in 1948. Just a one later, the company released their very first diesel engine. In 1961, Komatsu signed a deal with US corporation Cummins Engine Co. - a technology tie-up agreement. In 1993, both companies established Komatsu Cummins Engine Company Co., Ltd. (KCEC), strengthening their business relationship. KCEC company is designing small diesel engines for their own brand models: PC200 hydraulic excavators, D65 bulldozers, WA380 wheel loaders and many other machines. In 2010, KCEC achieved production of 500,000 diesel engines. One year later, in 2011, KCEC began production of Tier 4-certified diesel engines for construction equipment, after new emission standards have been applied in Europe, North America and Japan. EU Stage IV engines (since 2014) are efficient, eco-friendly and powerful. Compared to EU Stage IIIB engines, NOx emissions are reduced by 80%. Komatsu offers wide range of diesel engines, ranging from 2 to 12 cylinders (model 2D68 x model 12V140) and from 1,9 to 30,5 L displacement. Modern dozers like the D51EX-24, D61PX-24, D85EX-18 and 7 more machines represent the EX/PX series. Those dozers are powerful but environmentally friendly at the same time. It is possible thanks to EU Stage IV relevant engines, which are efficient and productive. The cab offers quiet and comfy space for the operator. All models are equipped with KOMTRAX™ tracking system, guaranteeing extended lifetime of the machines. Another key factor is a highly efficient hydrostatic drive line. It comes with a choice of two operating modes, “quick-shift” or “variable speed”, depending on the upcoming application in the most economic and easy way. What differs EX from PX models is the undercarriage. The EX undercarriage (standard) is designed for hard ground work, using small to medium-width shoes ensuring a large contact area for maximum stability and performance, increasing the undercarriage lifetime, whereas the PX undercarriage (low ground pressure) is optimal for working on soft surfaces, using the wide shoes. The D37EX-24 is currently the smallest Komatsu dozer on offer, being 9 t heavy, having 3.2 m wide blade and SAA4D95LE-7 diesel engine of 67,7 HP (90,7 kW). Intelligent Machine Control is a remarkable Komatsu technology. Since 2013, more than 2450 machines worldwide have run on iMC (over 1500 of them in North America). iMC is innovative, integrated and intelligent system, requiring no cables, climbing or connections. It uses 3D GPS system to automate dozers (automatic blade control system) for applications as grading and mass excavation. It is also supported with Komatsu´s service. Machines using iMC proved 20-30 % better performance than the machines without it. These are the iMC models available: D37EXi-24, D37PXi-24, D37EXi-23, D37PXi-23, D51EXi-24, D51PXi-24, D61EXi-24, D61PXi-24, D65EXi-18, D65PXi-18, D85EXi-18, D85PXi-18, D155AXi-8. Midi crawlers are a sort of happy medium between mini-excavators and large earthmoving machines. PC80MR-3, PC80MR-5, PC88MR-8, PC88MR-10 and PC118MR-8, all those models deal with the question of maneuverability and simultaneously decent power. Those models weigh from 8 to 12 tons. The PC80MR-5 premiered at the Intermat in Paris, showing off its strengths, such as an integrated counterweight, a tight tail swing radius and a swing boom that hugs the machine, making this model ideal for work in restricted and urban areas. The operator can take for granted working in a comfort and modern cab equipped with a high-resolution multi-functional 3.5” LCD colour monitor panel. New blade design and profile requires less repair and causes less down time. Every machine is taken care of by KOMTRAX™. This series unites models from 18 to 118 tons. The smallest one, the PC170LC-10, as well as the largest one, PC1250-11, feature impressive power output, stability, lifting capacity and comfortable cab. The engine outputs range from 121 HP (90 kW) to 775 HP (578 kW). Buckets capacities are also expanded, concretely from 0.94 m³ (PC170LC-10, PC170LC-11) to 6.91 m³ (PC800-8/PC800LC-8). All models are also secured by safety features, eg. rear and side view monitor system, lock lever auto lock system and emergency stop switch. As usual, updated KOMTRAX™ system is available. 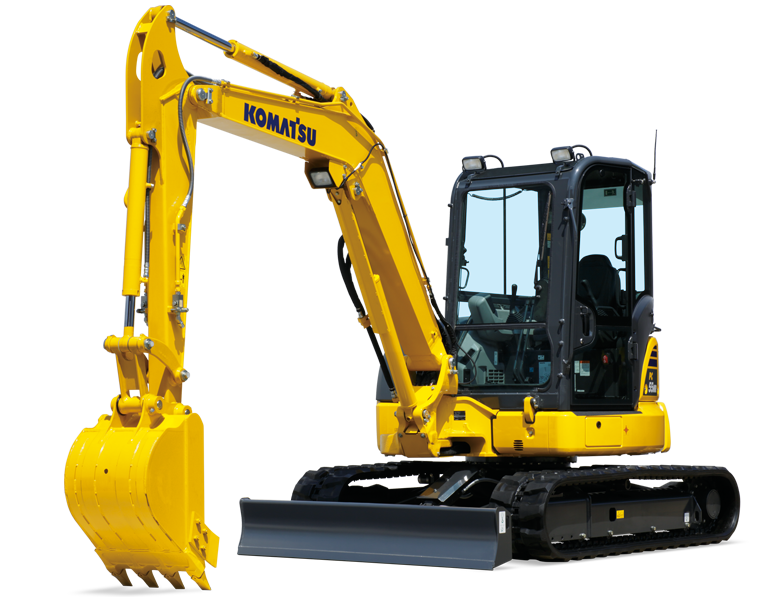 Since 2008, Komatsu has developed hybrid excavators. Starting with the PC200-8E0, Komatsu managed to create new class of machines. 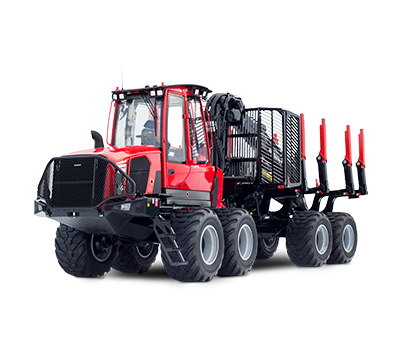 Hybrid crawlers are exceptionally economical, saving up to 40% of fuel in comparison with standard models. This automatically means less emissions released in the air, making hybrids more environmentally-friendly. HB215LC-2, HB215LC-3 and HB365LC-3/HB365NLC-3 hybrids offer comparable performance to their standard counterparts, overtopping them by of fuel consumption. This is possible thanks to the usage of electric energy and its regeneration: it helps the engine accelerate or swing the boom. Mining excavators belong to the largest and the heaviest of them all. The PC8000-6 is a true giant amongst the rest of excavators weighing up to 777 tons, having 42 m³ bucket capacity providing 8 m digging depth, while being driven by two Komatsu SDA16V160E-2 Tier 2 diesel engines of 4020 HP (3000 kW) total - it is the 5th largest excavator in the world (2017). Depending on configuration, the PC8000-6 can serve as a backhoe or a loading shovel. Other machines like PC7000-6, PC5500-6, PC4000-11, PC4000-6, PC3000-6 and PC2000-8 offer gadgets such as safety features, comfortable cab and low operating costs. Komatsu released Intelligent Machine Control technology in 2013. Since then, hundreds of operators tried the comfort this system offers. IMC provides automatic real time control digging. This prevents digging too deep or damaging the surface of the target. The PC210LCi-10 is the world's first intelligent Machine Control excavator. The PC210LCi-11 is a newer model, capable of the same functions as his predecessor. Moreover, three more models are available on the US market: PC360LCi-11, PC390LCi-11 and PC490LCi-11. Together with iMC Bulldozers like D155AXi-8 and Autonomous Haul System vehicles can Komatsu excavators establish a smart and efficient worksite. This is the largest diesel forklift serie with 14 models. These can be further divided depending on rated capacity. Each of them is build upon unique Komatsu hydraulic technologies, uses electronically-controlled hydraulic transmission and cooperates with KOMTRAX™ to maximize its potential. All diesel engines meet EU Stage IV/Tier 4 standards, reducing fuel consumption to minimum, therefore being more eco-friendly. The smallest model, FH35-2 offers 3500 kg rated capacity, whereas the largest one; FH160-1; provides 16000 kg. FH60-2 and models with higher number models have 4 wheels in front and 2 at the rear, the rest of them uses 2/2 wheel drive, eg. FH40-1 or FH45-2. FD40ZT-10, FD40T-10, FD45T-10, FD50AT-10, these are the 4 models included. All of them adopt the CLSS (Closed-center Load Sensing System) hydraulic system, a significant technology of Komatsu construction machines. In combination with SAA4D95LE-5-A engine, CLSS helps to reduce Co2 emissions by 6.5 tons in comparison with the previous engines (this one also meets EPA Tier 3 / EU Stage IIIA regulations). Komatsu offers two configurations of those models: a compact and a standard version. The compact one is designed mainly for operating in restricted spaced with a load center of 500 mm. Standard version is made for general-purpose applications; the load center is 600 mm. Each model is able to use a wide range of attachments, such as a side shifter, bale clamp, rotating fork, hinged fork or roll clamp. Displayed serie contains 3 models: FD60-10, FD70-10 and FD80-10. All of them feature SAA4D95LE-5-A Komatsu engine (69 kW output) in combination with hydraulic system. The models also feature durable wet brakes, which allow to achieve steady breaking, prevent the overheating and reduce the downtime and maintenance costs. The cab is noise and vibration absorbing, providing operator-friendly environment. Overall, this serie is very similar to CX50 series. Equipped with SAA6D107E-1 engine (122 kW output, 6 cylinders, Tier 3 compliant), all 5 models from EX50 series offer immense lift power. The machines manage to work with 10000 to 16000 kg of material. You can easily guess the rated capacity of the model by its name, eg. FD115-8 handles 11500 kg, FD135-8 handles 13500 kg and so on. The load centre is standard, 600 mm. All models have 4 wheels in front and 2 at the rear, controlled by hydraulic power steering. 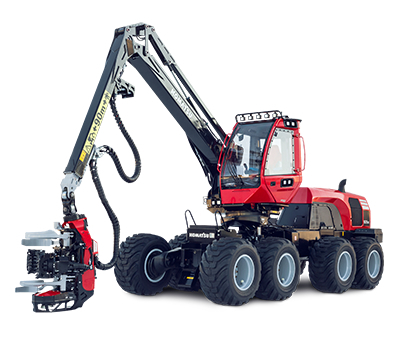 FD100-8 and the rest of the models can be upgraded with attachments like a pole carrier fork, ram, crane, furnace charger, tyre handler or manipulator. Komatsu range of 48V electric counterbalanced trucks is primarily suitable for indoor as well as for outdoor jobs, capable of handling up to 3 tons of materials. These trucks are stable and maneuverable yet strong. Hydraulic power steering ensures easy control in narrow spaces. The only difference between these 2 series is the number of wheels. Whereas AM-2R serie contains 4-wheels models (eg. FB20-2R), AE-2R serie consists of 3-wheel models (eg. FB20M-2R). Three wheels mean smaller turning radius, and therefore better performance in narrow spaces. Trucks ranges from 1300 to 2000 Kg of rated capacity with maximum lift height of almost 7 metres and are able to drive 14 Km/h (5 models in each serie). This series of electric forklifts is very similar to AM-2R serie. These models (4 in total) are also 4-wheeled, but they use 80V batteries. Higher voltage and battery capacity means that these machines are little bit faster (up to 20 Km/h). Model with the highest rated capacity is FB30H-3R, managing to handle 3000 Kg. All models have ergonomic driver environment guaranteeing maximum comfort and minimizing the vibrations transmitted to the driver. BE-3R also had the smallest curving radii on the market. The truck steers like a 3-wheeler, keeping the stability of a 4-wheeler. Series of three wheel lift trucks with a rated capacity between 1350 and 1810 Kg. The electrical system runs on 38 or 46V battery. There are 4 models, available in 2 compositions, depending on the battery voltage: FB15M-3, FB18M-3, FB18MG-3 and FB20M-3. Those Komatsu forklifts are extremely maneuverable due to individually controlled drive motors giving top performance for narrow turns. This serie includes 1-2 tons of rated capacity electric forklift trucks. It features original Komatsu Total AC system, efficiently reducing the cost of maintenance. Models are also equipped with water-resistant technology. All-around Dual Drive with AC 2 motors ensures dynamic travelling ability, providing maximum 17 Km/h travelling speed. FB15-12 and 4 other AE50 serie models are 4-wheeled, offering standard or large battery capacity. AM50 serie offers 8 three-wheeled models with standard battery capacity only, eg. FB18M-12. Apart from this fact, both categories share the same pros. FB20SHU-6, FB25SHU-6 and 3 more models can be found in this US market specialised category. Series highlights are EZ view mast system, KOPS Plus; Komatsu Operator Presence System allowing hydraulic or travelling operations only when the operator is properly seated; and AC master controller for self-diagnostics and low maintenance. Maximum fork height is 3,25 m for all models, drive motor power is 18 HP (13,4 kW) and the battery capacity ranges from 1,210 Ah to 1,650 Ah (ca. 6h of running). In 2016, Komatsu launched the 901XC, followed by the 931XC in 2017. The XC-series is characteristic of its 8-wheel drive (4 wheels in front and 4 wheels at the rear), compared to standard harvester 6-wheel drive. The revolutionary Komatsu design also features chassis with articulated joint and a swing axle, tilting cab and crane or Komatsu’s load-sensing stabilisation. The 901XC and 931XC combine the swinging rear axle with a bogie mounted on the single axle. The 901XC is 20 ton heavy machine suitable for thinning, offering 181 kN tractive force, 10 m reach (11 m optional) and 170 kW diesel engine. Its portal bogie provides stability and eight wheels help to reduce ground damage on soil and soft forest floor, which provides maneuverability in steep terrain. The 931XC shares the same benefits with the 901XC. Moreover, it is a stronger machine, offering 185 kW engine power, 186 kN traction power and 10 m reach, weighing 21,8 tons. The AX50 series delivers new technologies such as advanced Clean Air Technology, angled exhaust ports to keep hot engine air away from the operator, dual floating structure for operator’s protection, hydrostatic power steering or Komatsu KOPS Plus system. Model FG15HTU-20 is 2,8 tons heavy forklift with low turning radius of 1,96 m and maximum lift height of 3,25 m. FG15HTU-20 is powered by GCT K21 engine of 41,8 kW (56 HP). 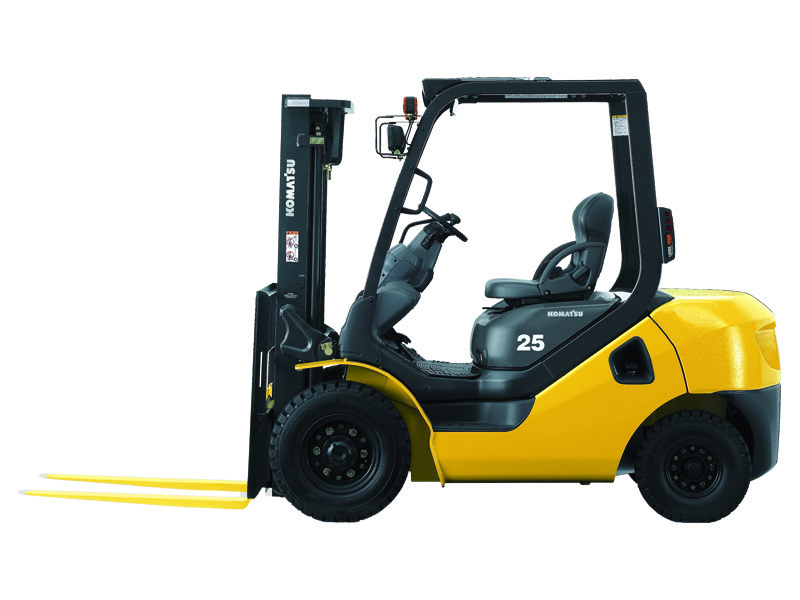 The fuel engine can hold up to 41,6 L and the forklift can travel maximally 20 km/h. The FG18HTU-20 is a little bit heavier model (3,04 tons), moreover sharing the same parameters with FG15HTU-20. However, FG18HTU-20 can lift up to 1,6 tons of material which is about 250 kg more than FG15HTU-20 (1,36 tons). The BX50 series ranges from 1,8 to 3,2 tons of lifting capacity. These models come with two types of tyres, cushion or pneumatic. Cushion tyres are made of smooth solid rubber, fitted around a metal band. They are cheaper to manufacture and easier to maintain, but they do not achieve the same level of traction as the pneumatic ones, mostly visible outdoors. The FG20ST-16 and the FG25ST-16 have rated output of 41,8 kW (56 HP) / GCT K21 engine. FG20ST-16 offers 1,8 ton capacity, whereas FG25ST-16 offers 2,27 tons. Both machines can travel up to 17 km/h. Other models, FG25SHT-16, FG30SHT-16 and FG32SHT-16 are driven by GCT K25 (44,7 kW / 60 HP). Their capacities are 2,27 tons (FG25SHT-16), 2,72 tons (FG30SHT-16) and 2,95 tons (FG32SHT-16). The travel speed is 17 km/h for all models. CX50 series of LPG forklifts features: 3-way catalytic system, full suspension seat, KOPS Plus, air cleaner, fully hydrostatic power steering, and more. The lifting capacity of the models FG40ZTU-10, FG40TU-10, FG45TU-10, FG50ATU-10 is 3,63 tons; 4,1 tons; 4,54 tons and 5 tons in this particular order. All machines are powered by GCT EBT-TB45-1A engines of 69 kW (92,5 HP), except for FG40ZTU-10, which runs on 62,5 kW (83,8 HP). Maximum fork height is 3 m for all machines. The smallest excavator in this range, PC09-1, is really small machine, but still powerful. Komatsu used its 80 years of experience in technology and constructed compact model capable of not only the easiest tasks. The PC09-1 features two travel speeds (1,5 km/h and 3 km/h), variable width undercarriage (180/225 mm), optional arm with demolition breaker (making this model a 2-in-1 machine), low noise levels, recycle-oriented design (environmentally-friendly), easy access to all inspection points for quick maintenance, robust cast body and complete visibility for digging. PC09-1 is powered by Komatsu 2D68E-3A engine (6,8 kW / 9,1 HP). The machine weighs about 880 kg (up to 1,1 ton with attachment). The bucket has a capacity of 0,016-0,025 m³ and can dig up to 1,47 m of depth. The PC14R-3, PC16R-3 and PC18MR-3 are part of MR-3 series and they offer short swing radius, making them ideal for use in restricted areas. Powered by Komatsu 3D67E and Komatsu 3D67E-2A engines of 11,6 kW/15,6 HP, these models offer quality performance. The digging depth is 2,41 metres and bucket capacity from 0,03 to 0,06 m³. In 2017, Komatsu launched 4 models of new MR-5 series, including PC30MR-5, PC35MR-5, PC45MR-5 and PC55MR-5. All those 4 new minis feature tight tail swing radius and swing booms made so that they manage to work in tight spaces, auto decelerator, 1st proporcional line, idle shut down, selectable working modes (6) and newly developed hydraulic electronic controls. An advantage of MR-5 models against their MR-3 predecessors (PC30MR-3, PC35MR-3, PC45MR-3 and PC55MR-3) is 5% less fuel consumption, without losing performance or productivity. 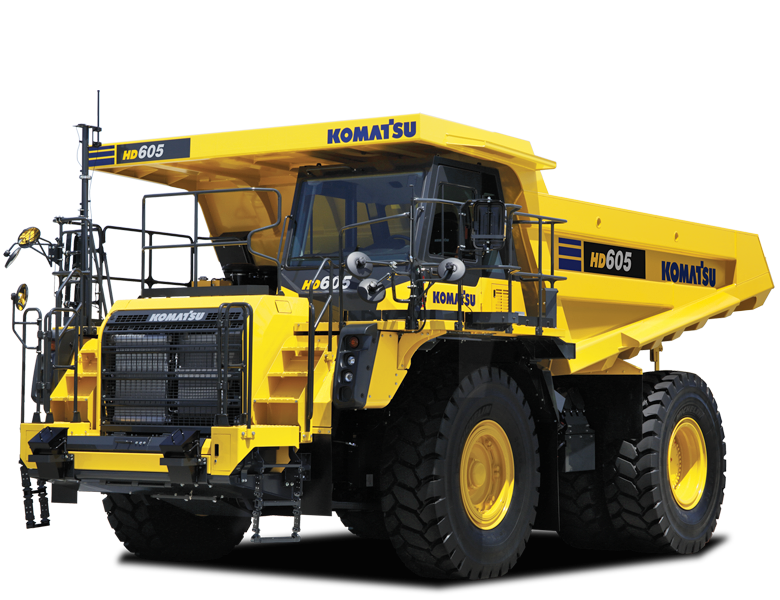 The newest generation of Komatsu HD dump trucks ranges from 36,5 to 142 tons of payload. All trucks are equipped with powerful Komatsu engines, constructed to work precisely with trucks of the same brand, which allows the trucks to transport the material quickly, easily and cost effectively. The “smallest” model available is HD325-8, combining increased engine power (386 kW/518 HP) and the Komatsu Traction Control System (KTCS), allowing it to improve the productivity even more. As a matter of course, HD325-8 features ergonomic and spacious cab, providing maximum operator’s comfort. 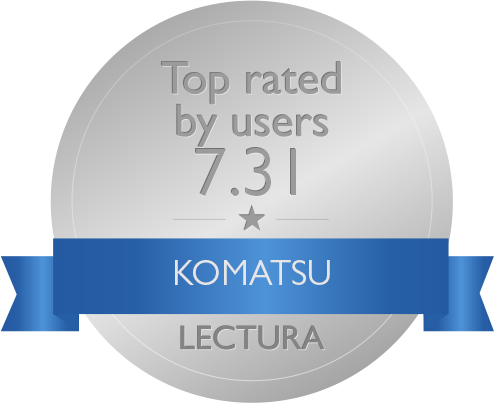 The Komatsu SAA6D140E-7 engine is Stage IV emission relevant, being as much eco-friendly as possible in this class. Heaped body capacity is 24,0 m³ (36,5 tons payload x 34,2 empty vehicle weight) and the truck can travel 68 km/h. Komatsu HD405-8 shares the same features with HD325-8, adding the smallest turning radius in its class (7,9 m). Its heaped body capacity is 27,3 m³ and max payload 40 tons. HD405-8 also uses the newest version of Komatsu Wireless Monitoring System: Komtrax 5.0, Komtrax Plus. Komatsu HD465-8 and HD605-8 are stronger and bigger machines than HD325-8 and HD405-8. Both machines share strong Komatsu SAA6D170E-7 engine (578 kW/778 HP) providing approx. 5% increase compared to previous models (HD325-7 and HD405-7). Both HD465-8 and HD605-8 also feature automatic idling engine shutdown, maximum 70 km/h travel speed and small turning radius of 8,7 m. What they differ in is the payload — 55 tons (HD465-8) and 63 tons (HD605-8) and heaped capacity — 34,2 m³ (HD465-8) and 40 m³ (HD605-8). Komatsu HD785-7 is over 11 m long and over 5 m high machine with 91 tons payload and 60 m³ of heaped body capacity. It also features additional pros such as variable horsepower control, automatic idling setting system or fully hydraulic brake system. Komatsu HD785-7 is powered by Komatsu SAA12V140E-3 engine with 895/1200 kW/HP power, enabling maximal 65 km/h travel speed. Komatsu HD1500-7 and HD1500-8 belong to largest machines in its class. Older HD1500-7 was launched in 2008 and has been replaced by HD1500-8 in 2018. The HD1500-7 brief specs are: payload capacity of 144 tons (250 tons weight), body capacity heaped 78 m³, Tier 2 Komatsu SDA16V159E-2 engine rated at 1119 kW (1500 HP), maximum travel speed of 58 km/h. The HD1500-8 is a redesigned model based on HD1500-7 offering: 142 tons rated payload, 78 m³ heaped body capacity, Tier 2 Komatsu SDA16V159-3 engine rated at 1175 kW (1576 HP), 11,2 m turning radius and 56,5 km/h travel speed. The whole machine is almost 13 m long and over 6 m high. The word “E” stays for electrically-driven trucks. All of them are manufactured at Komatsu America Corp's Peoria Manufacturing Operation, which is located Peoria, Illinois, USA. Komatsu actually offers 8 electric drive models: 730E-8 (182 tons payload, 77 m³ heaped body capacity, 1492 kW engine), 830E-1AC (222 tons payload, 147 m³ heaped body capacity, 1865 kW engine), 860E-1K (255 tons payload, 169 m³ heaped body capacity, 2014 kW engine), 930E-4 (292 tons payload, 211 m³ heaped body capacity, 2014 kW engine), 930E-4SE (290 tons payload, 211 m³ heaped body capacity, 2611 kW engine), 960E-2 (327 tons payload, 214 m³ heaped body capacity, 2610 kW engine), 960E-2K (327 tons payload, 214 m³ heaped body capacity, 2610 kW engine) and 980E-4 (370 tons payload, 250 m³ heaped body capacity, 2610 kW engine). Therefore, Komatsu 980E-4 is currently the largest Komatsu dump truck and ranks amongst top 10 in the world. These wheeled midi-excavators were created by Komatsu as a compromise between large earth-moving machines and compact mini-excavators. They combine the compactness and maneuverability with larger force. Komatsu PW98MR-8 and PW98MR-10 are smaller midi-excavators with bucket capacity ranging between 0,07 m³ and 0,28 m³. The digging depth is 4,3 m and operating weight around 10 tons. Both PW98MR-8 and PW98MR-10 are equipped with Komatsu engines rated at 50,7 kW (68 HP) Stage IIIA, respectively, Stage IIIB ready. Komatsu PW98MR-8 and PW98MR-10 have tight-tail and 4-wheel drive/steering, making them suitable for a wide range of construction, utility and landscaping applications. The other two models, PW118MR-8 and PW118MR-11, share some equal specs such as engine power (72 kW/97 HP), bucket capacity (0,4 m³), digging depth (4,33 m) and operating weight (13-14 tons), but they are also different. The PW118MR-11 is improved version of PW118MR-8, because it offers increased stability by 13% and higher lifting capacity. Moreover, PW118MR-8 features EU Stage IV engine, lowering the fuel consumption by 6 % against PW118MR-8 (EU Stage IIIA). Nevertheless, both machines are suitable for excavating jobs in narrow spaces, on-road construction sites or sewer-construction works. This series features the smallest (compact) Komatsu wheel loaders, from the oldest WA60 (1997) to the newest WA100M-8 (2018). The WA60 is rather outdated machine, offering 0,7 m³ bucket capacity, weighing 4,57 tons, driven by Perkins 504-2 T engine of 36 kW (48,3 HP). This model base was used for following innovative models: WA65-3 (1998), WA65PT-3 (2000), WA65-5 (2004), WA65-6 (2008). Similarly, the base of WA70 was used few times to be transformed into advanced models like WA70-5, WA70-6 and WA70-7. All three models offer 0,85 m³ bucket capacity, 20 km/h travel speed, 2,68 tons tipping load, ROPS/FOPS cabin and 41 kN lifting force. However, they differ in used technology and engines. The WA70-7 is the most technically advanced of the three, being equipped with Komatsu 4D95LWE5 — Stage IIIA diesel engine of 37 kW (49,6 HP) and the latest version of KOMTRAX™ (Komatsu tracking system). The WA80M-7 is also one of the latest models, featuring EU Stage IIIB Komatsu SAA4D95LWE-6 diesel engine of 52 kW (69,7 HP), latest version of KOMTRAX™, tipping load of 3,07 tons and 0,8-1,25 m³ bucket capacities. Its engine saves up to 10 % of fuel compared to previous model, WA80M-6. The Komatsu WA100M-8 features brand new ergonomic design, but the machine is build on the base of the previous model, WA100M-7. The WA100M-8 has an operating weight of 7 tons. It is equipped with EU Stage IV Komatsu SAA4D94LE‐3 engine with 70 kW (94 HP). Moreover, it features an integrated Diesel Particulate Filter (DPF) and Selective Catalytic Reduction (SCR) system. Thanks to this, NOx emissions are reduced by 80 %. The maximum travel speed is 40 km/h. Therefore, WA100M-8 is suited for agricultural works, on construction sites or in the recycling industry. The latest Komatsu mid-size series (2016-2018) ranges from 12 tons to 56 tons of operating weight. These machines offer a mix of performance, compact size and productivity together with low fuel consumption and high tractive force. The machines are equipped with either a hydrostatic drive line or Powershift. The smallest mid-size machine of the WA-8 series is the WA200-8 with automatic traction control, tipping load of 8,5 tons, standard 1,9 m³ of bucket capacity and 95,2 kW (128 HP) Komatsu SAA4D107E-3 Stage IV engine, making it an all-rounder suiting wide of range of onsite operations such as digging, excavation, earthworks, loading and unloading material. The WA270-8 is a similar all-rounder to WA200-8, offering 360°cab view, hydraulic quick-coupler for easy and fast attachment change, together with 10,3 tons tipping load, 2,1 m³ bucket capacity and 115 kW (153 HP) engine power. Another machines, WA320-8, WA380-8, WA470-8 and WA500-8 are larger machines, ranging from 15 tons to 35 tons of operating weight. Their bucket capacities differ in the attachment use and therefore range from 2,7 m³ to 6,3 m³ and the tipping loads range from 11,5 tons to 27,3 tons. The WA600-8 is the largest model in this mid-size series, weighing 56 tons. This model is based on WA600-6, but provides up to 13 % lower fuel consumption than its predecessor. Moreover, it features automatic digging system and high efficiency buckets ranging from 6,4 m³ to 7,8 m³, its tipping load is 36,1 tons and breakout force 387 kN. The WA600-8 is powered by Komatsu SAA6D170E-7 diesel engine of 396 kW (530 HP). These series features Komatsu’s largest and most productive wheel loaders. They are well-suited for working in harsh environment such as mines and quarries. They provide the best stability and productivity in the whole Komatsu wheel loader range. 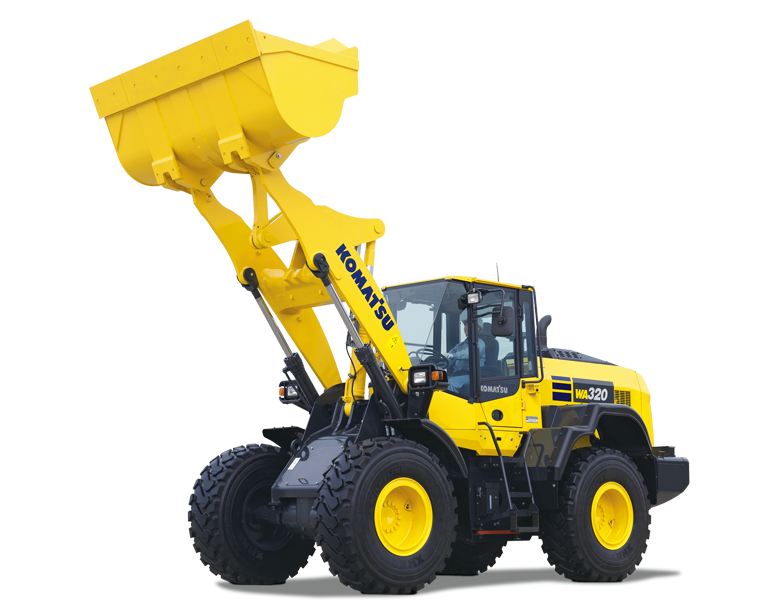 The WA800-3 is a 105 tons heavy loader with 61,1 tons of tipping load and standard 11 m³ of bucket capacity. The WA800-3 is powered by EU Stage II Komatsu SAA12V140E-3 diesel engine with 636 kW (853 HP) and has 676,7 kN of breakout force. The WA900-3 is a similar machine, offering 666 kN breakout force, 13 m³ standard bucket capacity, tipping load of 65,7 tons, weighing 107 tons. The WA900-3 is equipped with EU Stage II Komatsu SAA12V140E-3 diesel engine with 672 kW (901 HP). The largest Komatsu wheel loader is called WA1200-6 at that moment. It is equipped with 20 m³ bucket that can load a 140-ton truck in just 4 passes or a 180-ton truck in 5 passes (it can reach and load up to 320-ton capacity trucks, dump clearance is 6,3 m). High breakout force of 1275 kN and traction force of 992 kN, allow the WA1200-6 work in the toughest conditions of today’s mines. The machine also provides high tipping load of 121,9 tons, reaching interesting stability. The 7 metres high, 18,3 metres long and 5,8 metres wide machine is powered by Tier II (EU Stage II) Komatsu SSDA16V160E-2 diesel engine rated at 1411 kW (1892 HP), capable of maximum 18,7 km/h travel speed.